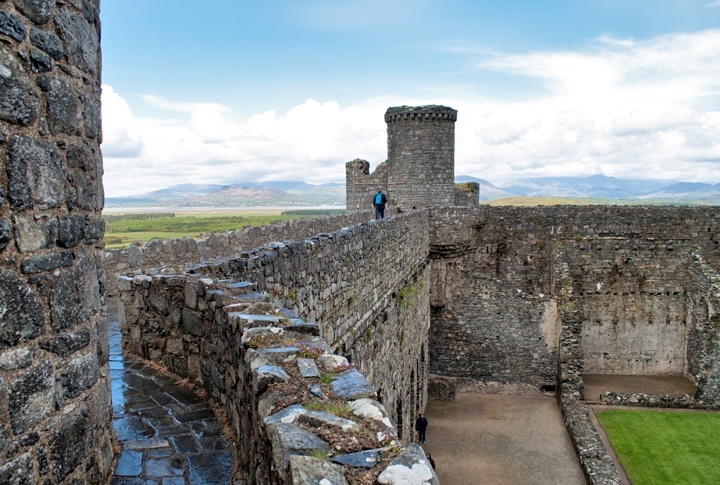 Perched on top of a rocky crag and towering over the North Wales countryside, Harlech Castle is one of the country’s most impressive medieval castles. 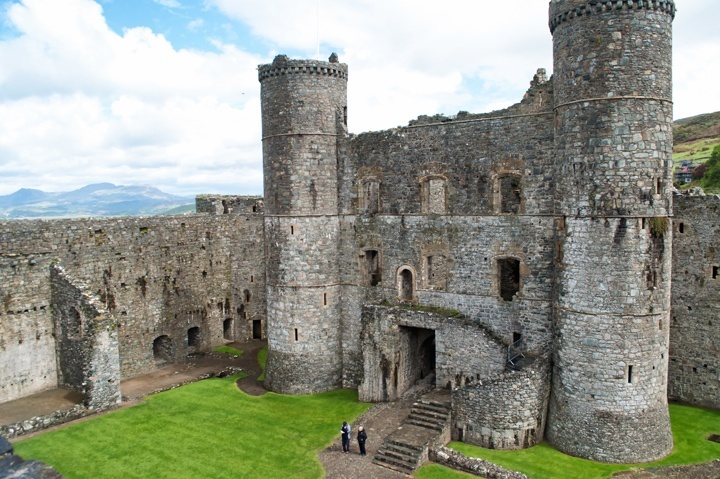 It was built by Edward I in the 13th century during his invasion of Wales. He chose a spot at the top of an almost vertical cliff with the sea below and had it heavily fortified with two rings of walls and towers, so there was no chance of anyone sneaking up on him. There was even a 61-metre-long secret staircase from the castle down into the base of the cliff so that when the castle was under siege supplies could be carried up from the sea without being seen – very crafty. 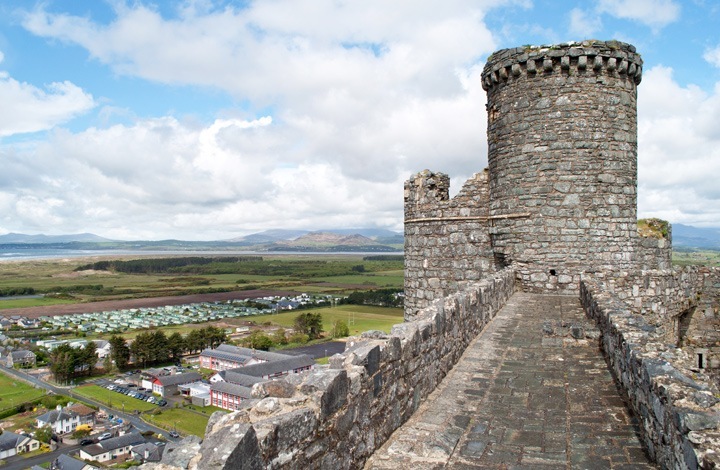 But Harlech Castle’s clever design features didn’t stop Owain Glyndwr capturing it for the Welsh in 1404 – and the English capturing it back five years later. It was besieged by the Lancastrians in the Wars of the Roses and was the last castle to surrender to Parliamentary armies in 1647 in the English Civil War. So much history in one castle, but after that a lot of it was destroyed and it ended up a ruin. But it’s unusual location up on the hill made it a favourite with artists like Turner, and in the 19th century it was restored. Today the internal wooden floors of the castle have rotted away and years of coastal deposits mean rather than being right on the coast, the water’s edge is a few hundred metres away now. But the secret staircase is still there, even if you don’t need a boat to reach it any more. The stone battlements are still standing too, and the castle has been listed as a UNESCO World Heritage site. 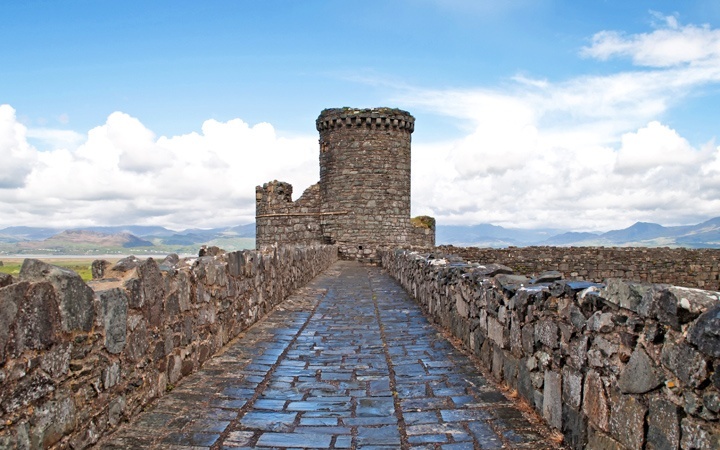 You can climb to the top of the towers and walk the same ancient walls that soldiers used to patrol back in the 13th century, with panoramic views out to the coast in one direction and towards the mountains of Snowdonia in the other direction. 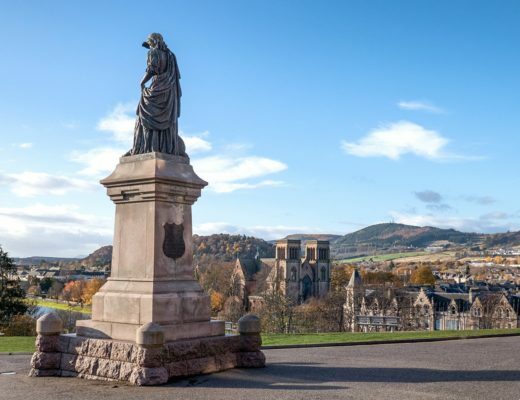 A new visitors’ centre has been built with a ‘floating’ bridge to connect it to the castle, and there are five new apartments in an old building just outside the castle entrance. So if you’re a castle fan then you’ve got a perfect vantage point to catch the sunrise or sunset over the ruins. 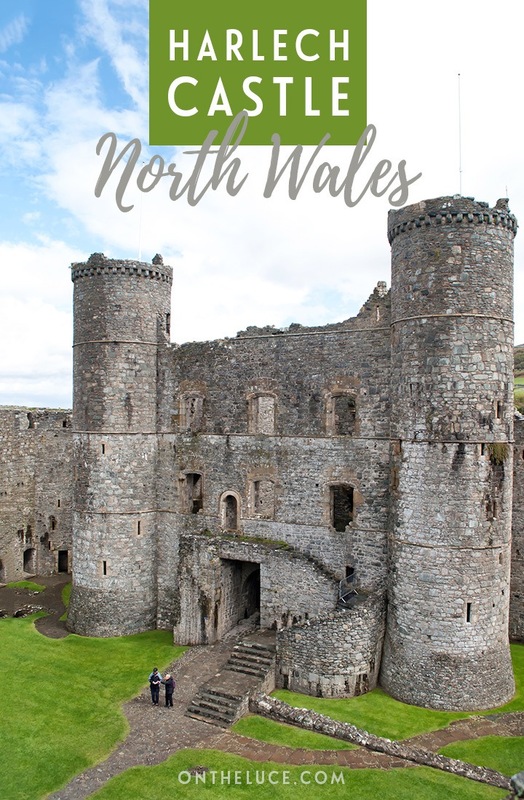 Beyond the castle, Harlech is a pretty town built of grey stone (a fair bit of it repurposed from the castle over the years), with cute little shops and cafés – don’t miss Llew Glas for tasty scones with jam and cream if all that history’s worked up an appetite. 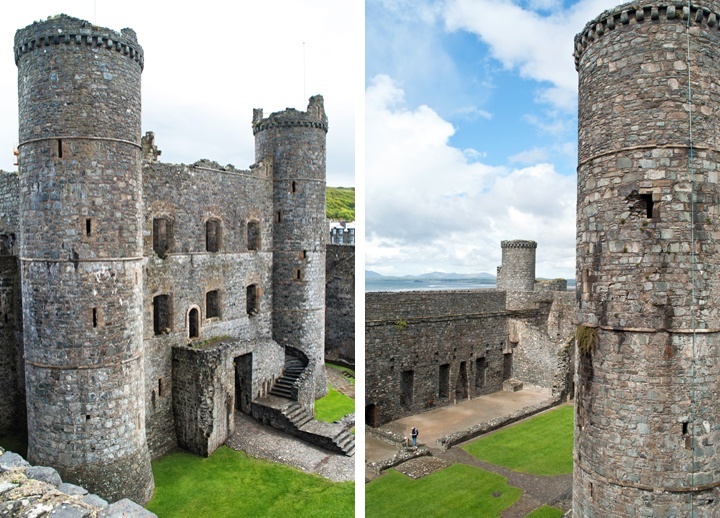 Harlech Castle is open 9.30am–5pm (6pm in July/August) from March to October and 10am–4pm from November to February. Entry costs £6.50 for adults and £4.20 for children, students and seniors. 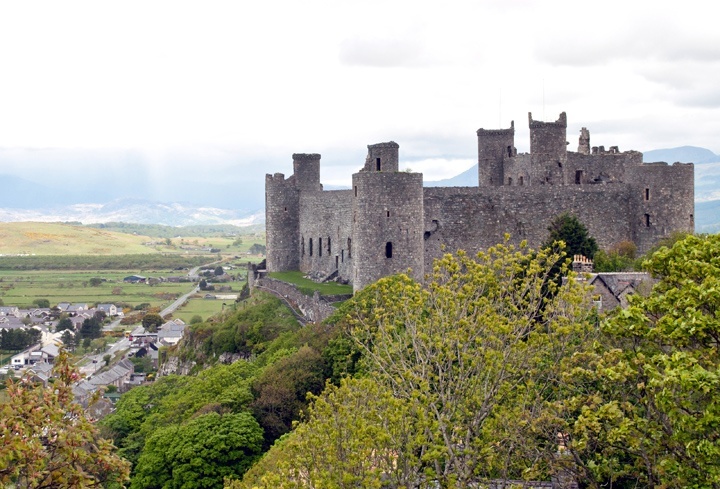 You can get there by train to Harlech station, then it’s a 200-metre (uphill) walk to the castle from there. 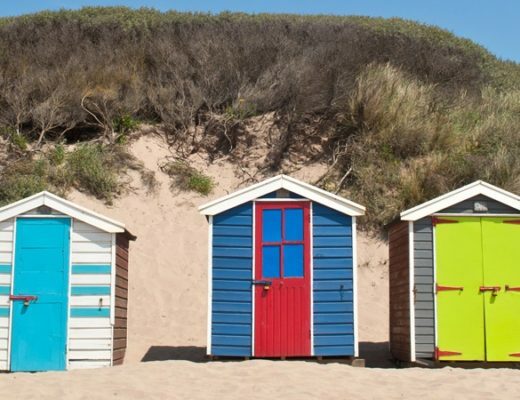 The Harlech Apartments are available to rent through Menai Holidays, starting from £267 for two nights. Beautiful pictures, and the light is so wonderful there! Thanks – yes we were lucky to get some clear skies as about 10 minutes before it had been torrential rain! What an impressive structure! 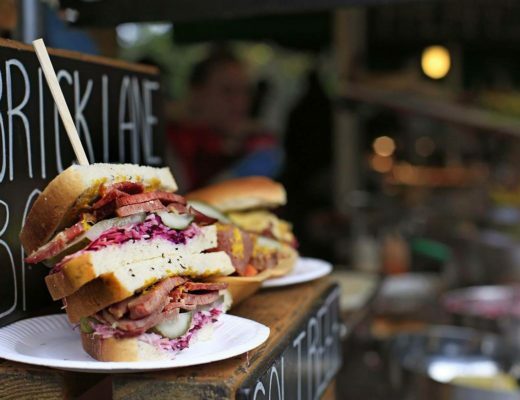 I must add this to my list of places to see! It’s still a really imposing building despite having sustained so much damage over the years. 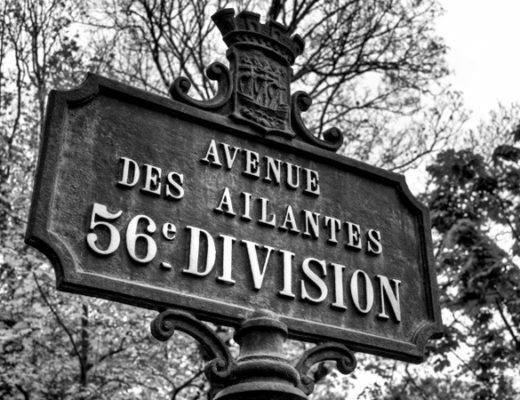 This is a place I would love to visit. I did visit Conway Castle a few years ago and loved it. 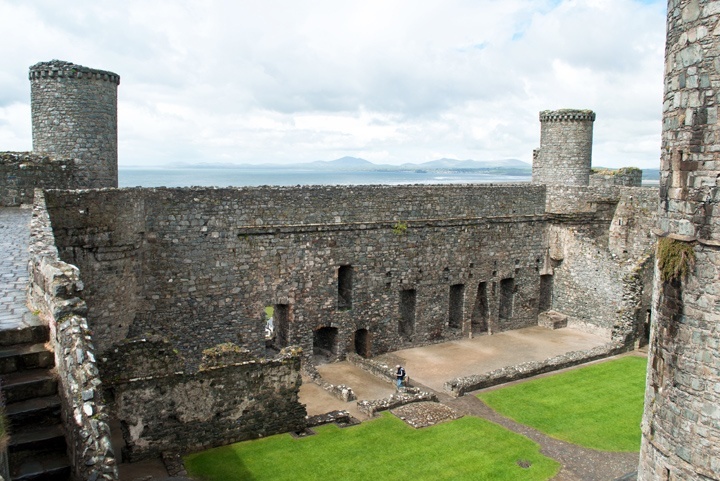 I’ve not visited Conway Castle yet but you are spoilt for choice when it comes to castles in that part of the coast! Wow I never knew this castle existed. It’s so grand and beautiful in its own way. Will definitely need to check it out one day! It’s in such a great location too, right on a hillside with those fabulous views! 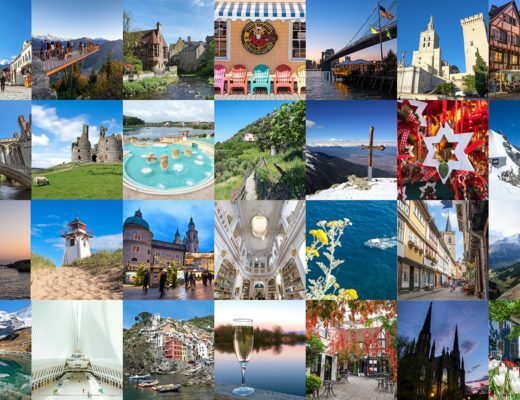 Gorgeous photos – and it looks like it has amazing views of the surrounding countryside, too! The views were great – it was so nice to be able to climb up the towers and look out over the coast. 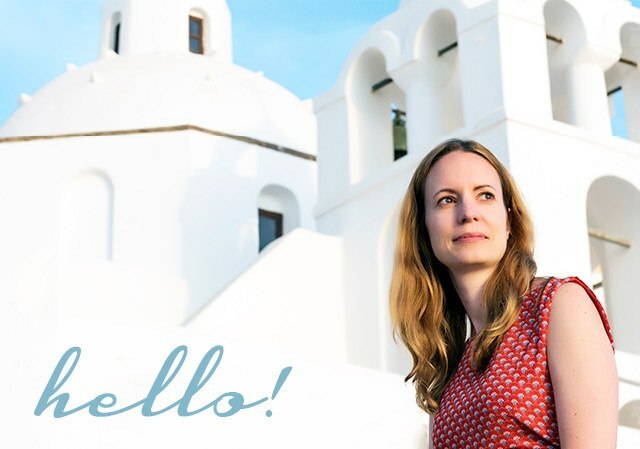 Wonderful photos Lucy – and a really impressive castle which I’d never heard of! Thanks Suzanne, we got so lucky with the weather when the sun came out as we’d been sheltering away from a torrential downpour just before! Absolutely stunning! Reminds me of Northern Ireland. Thanks so much! I must get out and explore more of Northern Ireland soon, I’ve only had a taste so far but really enjoyed it. 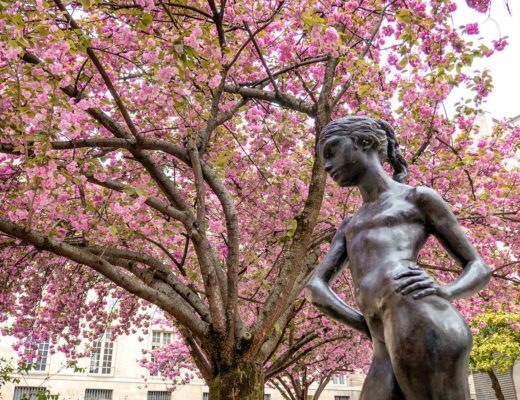 It’s definitely an underrated place – though I guess the bonus of being a hidden gem is that it’s not so busy! Thanks Mike, we must’ve been there just the week before you! Sounds like you have a great trip planned, enjoy you travels.